There are no words really. I'm not quite sure what happened to the Cubs. It's hard not to believe in curses when you so completely self destruct like that. They just seemed like a different team. The Cubs have now not won a single post-season game since the Bartman incident. 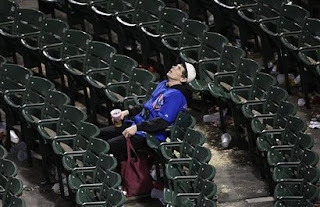 Ok, really they lost the game before Bartman too, so it's been 9 straight loses. But still. This was supposed to be the year dammit. How did this happen?